So I ask: What's on your "To Do" list that belongs on your "Stop Doing" list? It's a constant battle that I struggle with too! I only take 15 students in the live courses. They're in a conference call format. All notes are emailed to you in advance and then you get a phone number and password to join me and your fellow students in the live calls on the five designated evenings. I'm hosting a live chat August 24, which is f'ree to all Staging Diva Network Members. Sandy is my Executive Assistant who does a great job getting Graduation Certificates out to you in a timely fashion, keeping the Staging Diva Network humming and many other behind the scenes details. Feel free to email her when you need help! While I don't agree with their claim that this book tells you everything you need to know to be a home stager, it does have some great content. You'll also find success stories of leading stagers (I'm one of them) plus quotes from a variety of others, including Staging Diva Graduate Lauren Bartell who was discovered by the writer on the Staging Diva Directory. Wow, July flew by and now we're half way through August! Apologies for not having an issue of Staging Diva Dispatch since June. This is highly unusual. I was caught up with the sale of my home and moving to the new one, plus getting my daughter organized for a month of camp, my corporate year end, media interviews, coaching Staging Diva Graduates who are part of the Business Accelerator Program*, doing an hour long radio call in show and various projects for clients. I'm loving my new house. I bought my first real estate in my late 20s and it seems only fitting that I've finally found my dream home as I head into my 50s! Well, I'm not there yet. Two more years, but I plan on living here for that milestone. * The Business Accelerator Program is two hours of one-on-one business coaching with me. You get six months to use your time and you can split it up into shorter session. It's offered to you for only $300 when you order all five courses (live or recorded). Business coaching with me normally costs $300/hour so you s.a.v.e $300 with this option. This photo (top right) from the June issue prompted lots of inquiries. It was of my kitchen in the house I just sold. 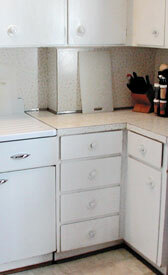 The old 1920s laminate counter tops and backsplash were painted a deep aubergine color. I first painted them because I couldn't stand walking into such an ugly room every morning and for a magazine spread in Women's Day Magazine. They really held up over the years. All I did was sand them to rough them up a bit, primed and then rolled on melamine paint. 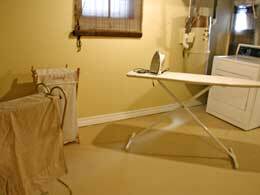 When it was time to put my house on the market 5 years later, I just rolled on a single fresh coat (because I'm obsessive about home staging details). What you didn't see last time, was what my kitchen looked like before the paint, hardware, and new floor makeover. Here it is below right. It's interesting that the agent told me the new buyer loved the kitchen, it was part of what sold her on my house. This goes against the conventional wisdom that says "neutralize everything." In fact, none of my house was neutral and that's part of why it stood out in a sea of beige houses of similar design, many of which had new kitchens with granite and stainless steel appliances! 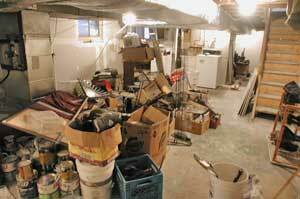 If you've got a client with an unfinished or partially unfinished basement that looks like this one above, there is a ton you can do to improve the situation. First of all, just because it's unfinished, don't assume it can't look like a room. 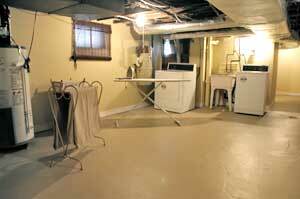 It's amazing what a fresh coat of paint (even over concrete floors) will do. Here I used Benjamin Moore Dunmore Cream (HC-29) on the walls since some of them were finished, and Sag Harbor Gray (HC-95) on the floor. If you need help choosing colors, check out the "Staging Diva Ultimate Color Guide: the easy way to pick colors for home staging projects"
Get the clutter off site. Install window blinds to hide bad views. Prop to show a use for the space. Thanks to Staging Diva Graduate Shiva (Sherry) Gorjianfar, whose inquiry motivated me to write this story and share a few long-forgotten photos with you. "I finished my first staging job which more than paid for my course, as well as my profile page in the Staging Diva Directory Of Home Stagers! My clients had a real estate agent say she would list their house for $305,000. After I staged it for them, they decided to sell it on their own. They sold 4 days before their first open house for $330,000--- $35,000 more than the agent's estimate, plus they saved her commission! What astonishes me more than anything is that one month after taking your course and joining the Directory, my staging business is debt free after only one client! After 5 years of owning a retail business all I can say is, you can’t get much better than that! Thank you for helping me embark on the incredible journey!!" Congratulations to Donna Warwick who in July became the first Staging Diva Graduate from New Zealand! It prompted me to do some research and I learned that New Zealand is actually the most remote country in the world (4,000 miles from Australia across the Tasman Sea), with a high per capita income, and real estate values that went up in the double digits this year. Congratulations to Staging Diva Graduates Victoria Willits (top) and Sue Parro (bottom) of Fresh Look Design on staging a living room of a spec house for an upcoming show on HGTV. They had only 48 hours to pull it off and did it beautifully! If you want to do anything for the media, be prepared to drop everything for them, there's almost never any lead time! Congratulations to Gary Baugher of An Eye 4 Change who just completed his first year in his staging business. Gary always entertains me with stories of his latest projects. He's really taken Nashville by storm! For his latest project he beat out a stager who has been in the business for 12 years. Gary writes, "this business is contagious. Somehow I always manage to find the energy to do what I love. Thanks for all your support and knowledge." Congratulations to Staging Diva Graduate Debra Rowley of Debra Rowley Interior Staging on her first staging project, of a $1.9 million home no less! It earned her over $5,000 and a portfolio of professional shots of a magnificent home that will help her attract future clients. First, you never know what homeowners will ask. Second, while their agenda was to help homeowners do it themselves, MY agenda was to communicate that professional stagers have a role and how to find them on the Staging Diva Directory of Home Stagers. I did manage to work that in while (hopefully) not sounding too commercial. 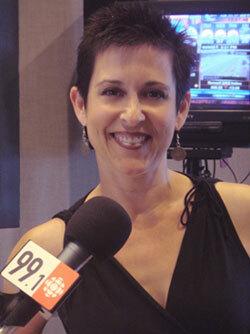 I also discovered I love doing radio. The switchboard was lit up for the full hour and I could have kept going I was so pumped! It was also a nice diversion from unpacking since I had just moved. "Keeping that Brand New Home Look"
In addition to being online, the magazine is distributed f/ree throughout the GTA area with a distribution of 50,000. 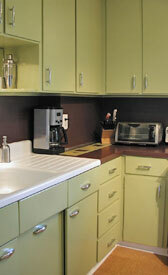 Watch for a feature story on low-cost kitchen makeovers in the Back to School issue of Together Magazine this fall. I haven't seen it yet, but it may be out. The writer still doesn't have the publication date, but she'll let me know. A growing number of reporters are grabbing their stories right off my websites without even interviewing me. If any of you see me in a local paper or magazine, I'd appreciate you letting me know! According to a new student, I was apparently mentioned on HGTV recently. If any of you knows what show, please let me know! I'd be happy to send you a thank you gift in exchange for a copy of the story!